Six of Swords is an adventure anthology for Blue Rose, the AGE Roleplaying Game of Romantic Fantasy. Set in the fantastic world of Aldea, these six adventures are suitable for different levels of characters, and also intended as examples and resources for Narrators. THE MISTRESS OF GLOAMHALE MANOR pits the heroes against the inhabitants of a haunted mansion in a search for the truth. A HARVEST OF MASKS begins with mysterious abductions from Aldin villages. who are the masked abductors and what do they want? STORMS OVER KAMALA finds the heroes out on the wild Plains of Rezea to challenge the forces that have claimed a witch's ancient homeland. A WANTON CURSE is set at a high society masked ball in a castle on Gravihain Eve. What dark secrets are some of the guests concealing? The adventures in this book include ruined mansions, masquerade balls, vampiric curses, mysterious masks, sorcerous secrets, ghostly hauntings, lost loves, looming threats, and tragic quests where heroes are called upon to make the right choices. 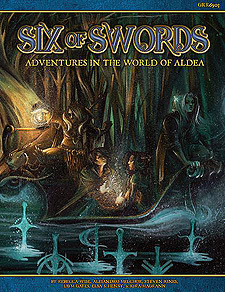 Six of Swords has hours of adventure, excitement, and entertainment for your Blue Rose game.